You have a wide variety of resources at your disposal. From student organizations and student affairs to academic resources, counseling and tutoring, we strive to ensure our students have the tools needed to succeed. All undergraduate students should contact their MEE engineering advisor for assistance in building their own unique degree plan. Advisors can ensure that each student receives detailed information regarding requirements and expectations for their respective degree and education path. Students can discuss their degree plan with a MEE engineering advisor. If you are an undergraduate student and need to change your degree/major, you can contact the College of Engineering advisors by clicking here or call +1 (940) 565-4201. The College of Engineering Advising office includes advisors and counselors who assist students through support activities such as: new student orientations, assistance with registration issues, choosing a major and/or minor, clarification of degree requirements, completion and final approval of degree audits, clarification of university and college policies and procedures, preparing degree audits, and filing for graduation. You might find that you need an advising code to register for your courses. Please read and follow the instructions below depending on the reason the advising code is needed. Understanding the academic organizational structure and appropriate Chain of Command is important when resolving class-related issues. When you need problems resolved, you should start with your individual faculty member who will then help you navigate the Chain of Command shown below. b. a decision based on an error in fact. 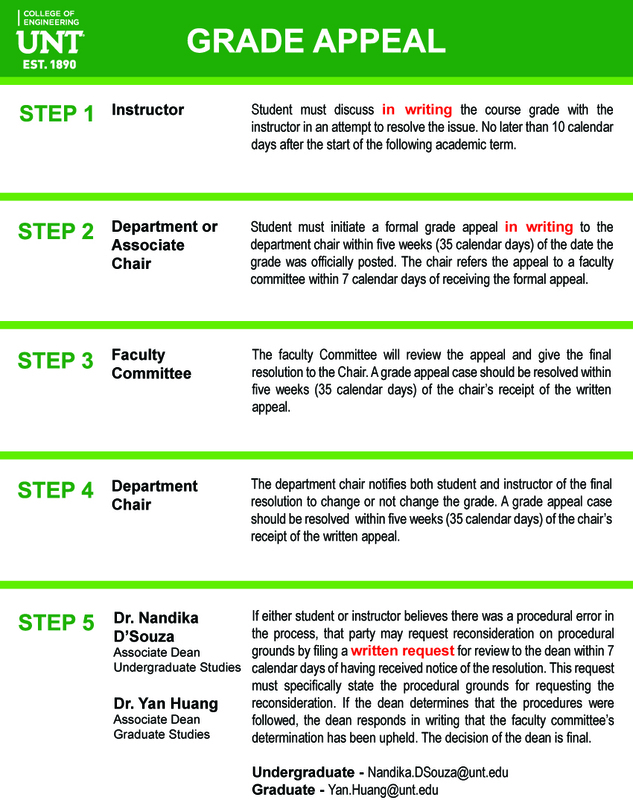 If the student believes that the grade was assigned inappropriately due to discrimination or sexual harassment, the case must first be resolved through procedures for such complaints (see UNT Policy 16.006, Information and Procedural Guidelines for Pursuing and Resolving a Complaint of Discrimination, Including Sexual Harassment) Changes in a grade due to violations of academic integrity cannot be appealed through this process. The College of Engineering cooperates with the Office of Disability Accommodation to make reasonable accommodations for qualified students with disabilities. If you have a disability for which you will require accommodation, please present your written accommodation request by the end of the first week and make an appointment with the instructor to discuss your needs. The use of unauthorized assistance in an academic exercise, including but not limited to the use of any unauthorized assistance to take exams, tests, quizzes or other assessments. Dependence upon the aid of sources beyond those authorized by the instructor in writing papers, preparing reports, solving problems or carrying out other assignments. Acquisition, without permission, of tests, notes or other academic materials belonging to a faculty or staff member of the University. Dual submission of a paper or project, or re-submission of a paper or project to a different class without express permission from the instructor. Any other act designed to give a student an unfair advantage on an academic assignment. Use of another’s thoughts or words without proper attribution in any academic exercise, regardless of the student’s intent, including but not limited to: the knowing or negligent use by paraphrase or direct quotation of the published or unpublished work of another person without full and clear acknowledgment or citation. The knowing or negligent unacknowledged use of materials prepared by another person or by an agency engaged in selling term papers or other academic materials. Altering a score, grade or official academic university record or forging the signature of an instructor or other student. Falsifying or inventing any information, data or research as part of an academic exercise. Helping or assisting another in the commission of academic dishonesty. Acting to prevent others from completing their work or willfully disrupting the academic work of others. The following academic penalties may be assessed at the instructor’s discretion upon determination that academic dishonesty has occurred. Admonitions and educational assignments are not appealable. The student may be issued a verbal or written warning. The student may be required to perform additional coursework not required of other students in the specific course. The instructor may award partial or no credit for the assignment or assessment on which the student engaged in academic dishonesty, to be calculated into the final course grade. The instructor may assign a failing grade for the course. Should the procedure for appeal of a case of academic dishonesty extend beyond the date when the instructor submits course grades for the semester, the student will be assigned a grade that reflects the penalty, which shall be adjusted, as appropriate, at the conclusion of any appeal process. MEE is involved with many student organizations and our faculty are advisors for some. Student organizations are beneficial for students to be involved with as you can gain opportunities such as scholarships and internships. As your final year approaches be sure to check these resources to help you prepare for Graduation. Before you register for your final classes, schedule an appointment with an academic advisor to review an updated copy of your degree audit. At the beginning of the semester you plan to graduate, you must apply for graduation by the deadline listed at the Registrar. Applications can be obtained in the Registrar’s Office (located in the Eagle Student Services Center) or in the Engineering Advising Office (located in Discovery Park A101). Applications must be completed and submitted to the Engineering Advising Office by the deadline. Applications received after the deadline will not be accepted. Other GPA requirements besides the university’s core requirements, such as math, science, communications, and major, count toward your graduation. You should consult with your department advisor about those requirements. Check out the available resources UNT offers to help you prepare for your engineering classes. Check out the website of the Council of Engineering Organizations for student organizations that fit your interest. Check out the available resources UNT offers to help you stay physically and mentally healthy.